Rankin & Taylor, PLLC is no longer accepting new cases. We would like to thank all of our clients and friends who have made the years at Rankin & Taylor extremely rewarding, you all are the best! If you are seeking legal representation, please call Beldock, Levine & Hoffman LLP at 212-490-0400 or email David B. Rankin at DRankin@blhny.com. Mark C. Taylor left the practice in early 2016 and now practices housing law with Legal Services NYC. Gladys Iturralde has stayed with the office suite and is now the office manager for Bernstein Clarke & Moskovitz, PLLC. Jane L. Moisan has relocated to Portland, Oregon. 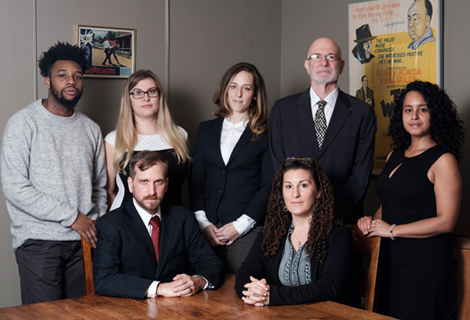 David B. Rankin, Gillian Cassell-Stiga, Abigail Robinson, and Donald Pooler have moved to the civil rights and general practice law firm of Beldock, Levine & Hoffman LLP. Please feel free to contact us there. If you had / have a matter with Rankin & Taylor, PLLC, please contact David B. Rankin at DRankin@blhny.com. Please update your contact information accordingly. However, all the phone numbers and email addresses will continue to forward to the correct people for the foreseeable future.